They left Aleppo for southeastern Turkey just over three years ago. 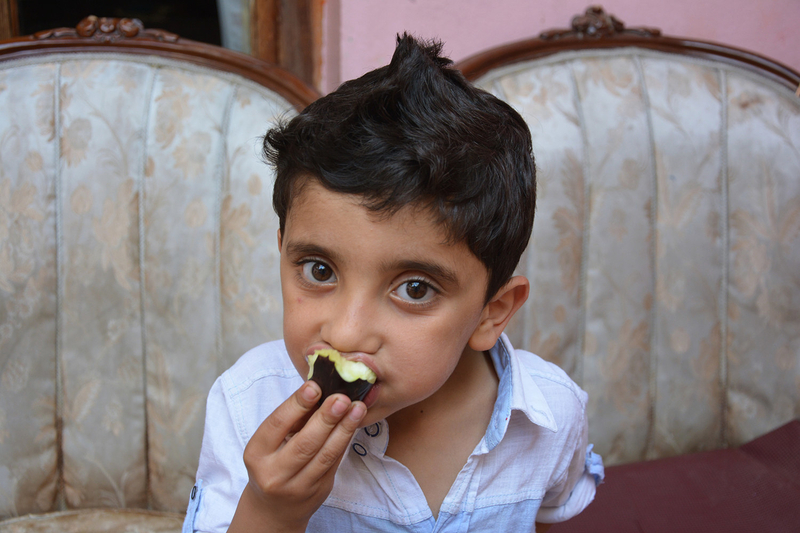 This post follows a typical day in the life of a Syrian refugee family, who are currently living in the Turkish city of Gaziantep. 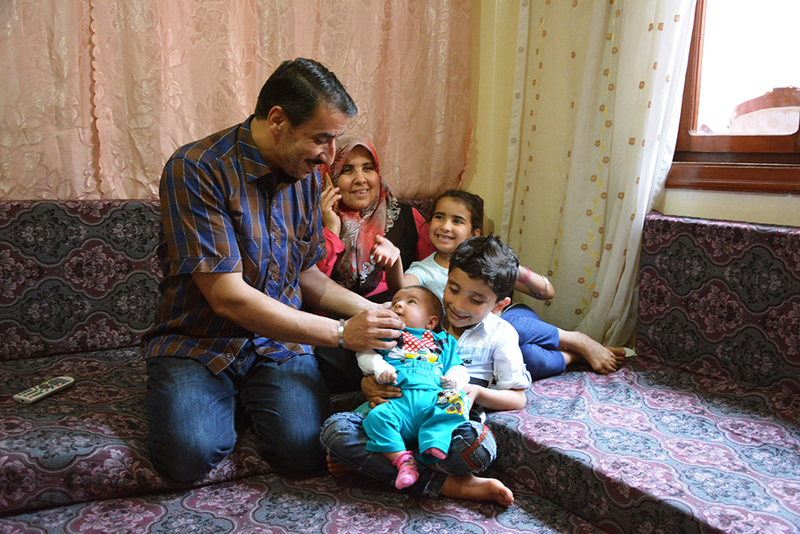 Mohammed (40) and Fatma (39) rent an apartment with their three children, Bushra (6), Mariam (8), and Mohammed (5). 7am: Mohammed and Fatma wake up. 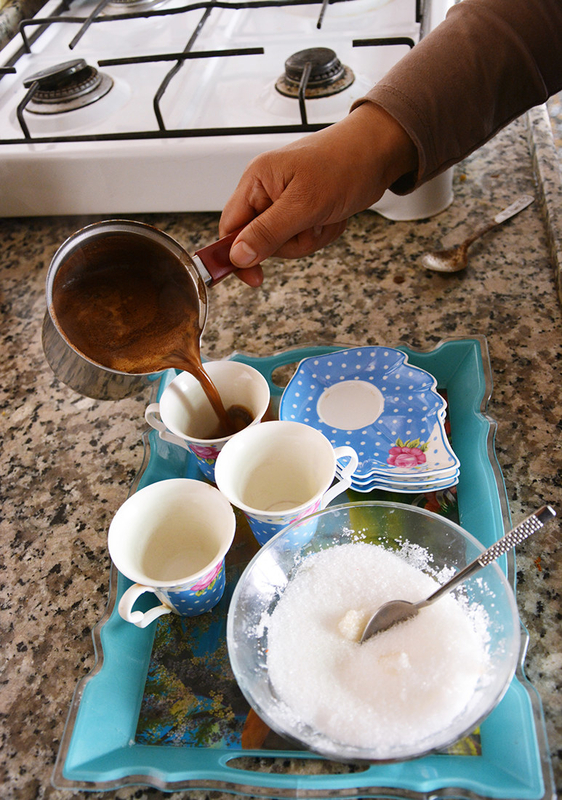 Mohammed and Fatma have coffee together every morning before Mohammed goes to work at a soap factory. 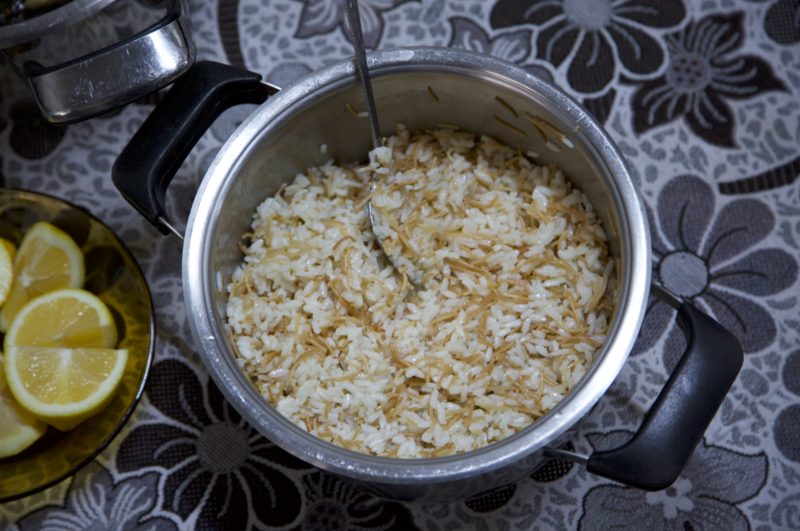 They make traditional Syrian coffee in their ibrik on the stove. Work at the soap factory comes and goes depending on production needs, so Mohammed takes whatever work he can find. 9am: The children wake up and get ready for the day. The three children, Bushra, Mariam, and Mohammed, sleep in one room, on cushions that are laid out on the floor. The first thing they do in the morning is have their breakfast, which is usually warm milk. Later, their local relatives come by to visit. They try to see their extended family three to four times a week. 11am: The children get started on their homework. 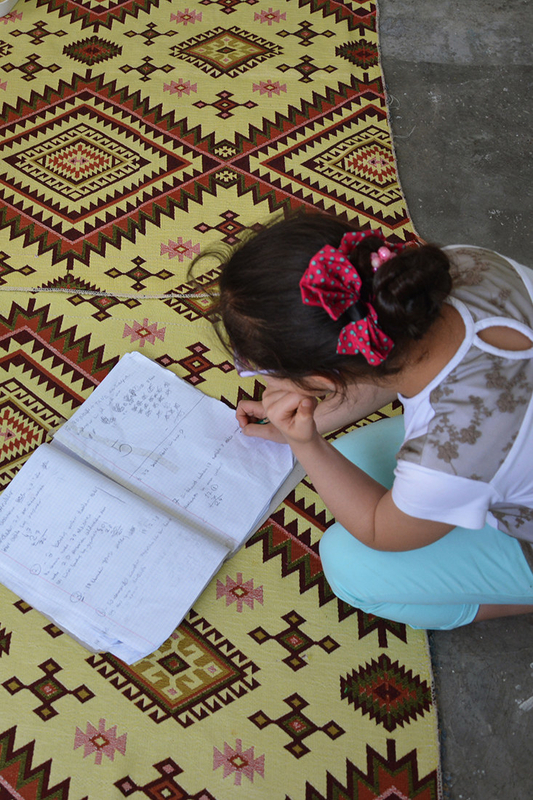 Mariam, the oldest daughter gets started on her school work – today, it's maths. 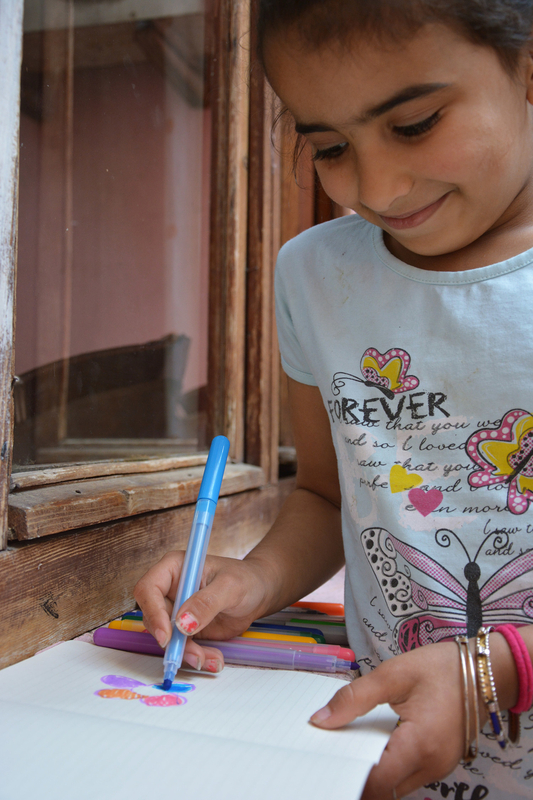 Fatma teaches the younger two children at home, to prepare them for school when they're ready to go. Fatma and her niece Hiba are looking at a picture of Hiba and her older sister dancing at a relative's wedding. For the wedding, Hiba's parents bought her a new T-shirt, and she likes to save it only for special occasions. 1pm: The family come together for lunch. They're having their usual lunch of pita bread, cheese, and mint. The spread is laid out on the floor in one of the rooms, which is also used as the parent's bedroom at night. Fatma tends to buy food from the vegetable market downtown, where other refugees from Aleppo have stalls and shops. She prefers the market to the supermarket as she can chat with other refugees and also can negotiate on price. 3pm: The children go out to play. 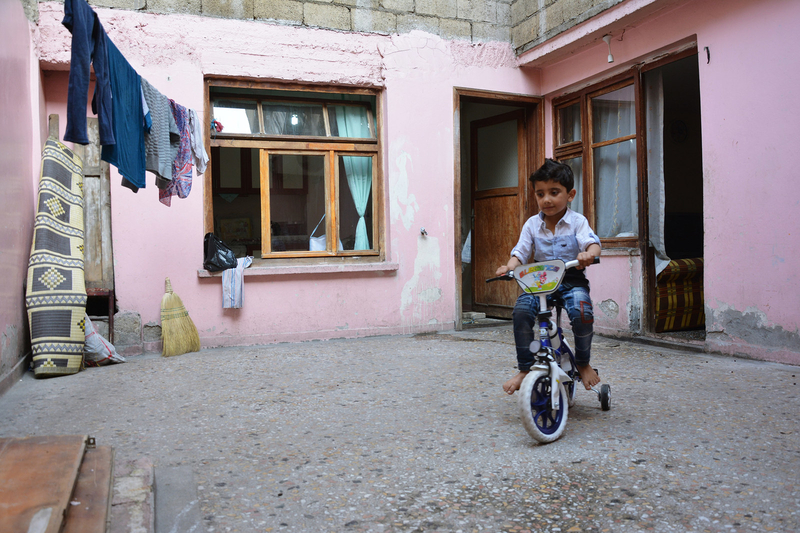 The apartment has a small yard where the children like to play patty-cake and where Mohammed rides his bike. They also often play out in the street with the neighbours. 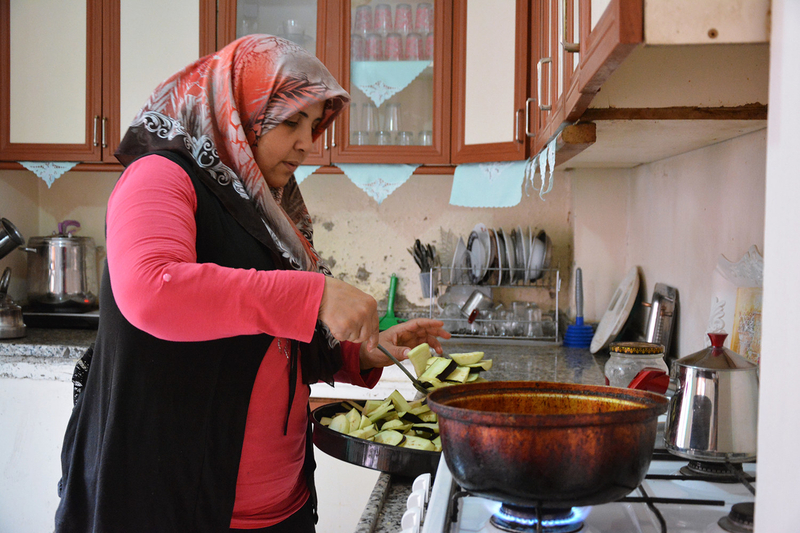 Fatma gets started on the household chores, including making bread for dinner. Bushra (front) and Mariam (behind) are thrilled because their mother has surprised them with new jeans and T-shirts in their favourite colours. Getting new clothes is a rarity for the family, as they usually do not have enough money to buy them. However, the children sometimes like to swap clothes with the neighbours. 5pm: Mohammed comes home from work and the family has tea together. After, he sits with his daughters to catch up on news from Syria from an Arabic news channel. Bushra and Mariam like to watch TV with their father so he can answer their questions about the news. Mohammed uses a smartphone app to contact his relatives in Syria every day, exchanging voice notes and photos. His son always waits for his father to come home from work, in order to see if there are any new incoming messages, as he doesn't like missing out on any news. 8pm: It's time for dinner. Like with lunch, the family always makes sure to eat with each other. Today they are having rice and aubergines for dinner, which is their staple meal. Once a year, they can save up enough to have meat instead. As work isn't stable, there are times when the family can't afford food and have to do without. 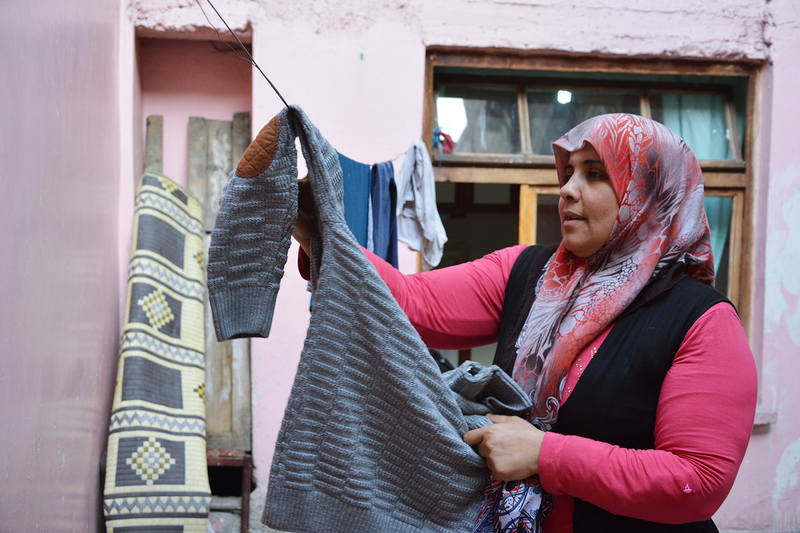 What's most important to Fatma and Mohammed is living in an apartment with walls, so they feel safe and protected – even if that means paying more in rent. 10pm: The neighbours come by for tea. There are a few other Syrian refugee families living around the area, and they like to spend the evenings together. They often support each other in times of hardship and share news with each other. 11pm: The family goes to bed. Mohammed and Fatma will finish up any remaining chores before bed, once the children have gone to sleep. At night, the two rooms in the house are turned back into bedrooms. All photos courtesy of WFP/Deniz Akkus. The European Union has given €348 million to a social assistance scheme that will allow more than 1 million of the most vulnerable refugees in Turkey to cover their basic daily needs. The Emergency Social Safety Net (ESSN) is implemented by the World Food Programme and the Turkish Red Crescent. Watch this video to hear Nour, a 7-year-old Syrian girl, explain how she came to Turkey with her family and what her day-to-day is like now.